High in fibre. Wholegrain. Low salt. Contains folic acid. No artificial colours. 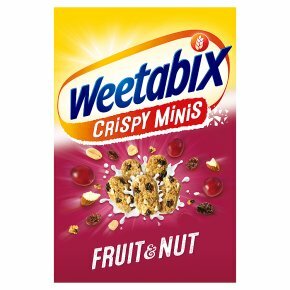 Suitable for vegetarians.Fuel your day+ +Weetabix Crispy Minis Fruit & Nut is two thirds carbohydrate which provides energy to the body as part of a healthy diet & lifestyle.